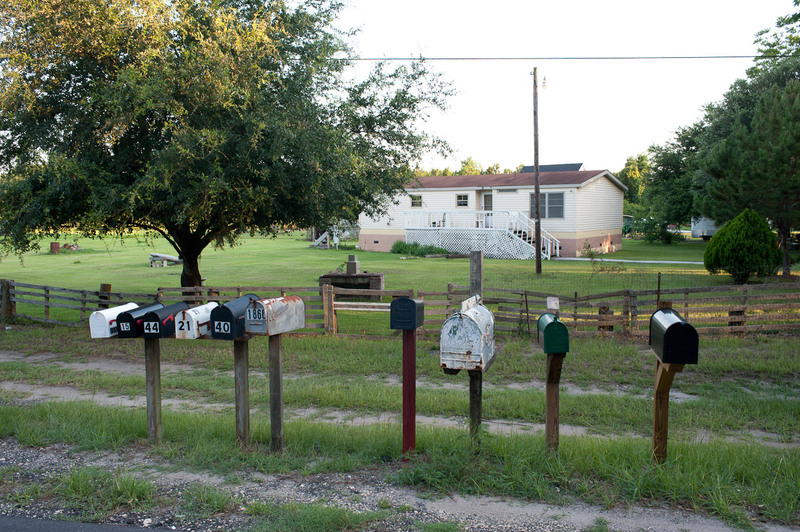 Former magistrate Joe McDomick has worked on issues surrounding Gullah land use for years. Land that was acquired by freed slaves after the Civil War is now prime real estate and under development pressure that threatens the community way of life development. Preserving and protecting it is essential to the survival of the Gullah culture. Access to and tenure of land has been fundamental to the Gullah communities since the time of slavery. 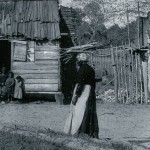 During slavery times, Gullah ancestors lived in slave villages, lined up in straight rows, dictated by the plantation owner. Today, families live in compounds, in the tradition of their African heritage, where no line is straight, and the right to a home is based on family ties. Perhaps most significant historical factor in the development of the distinctive Gullah community and landscape was the purchase and allotment of land during the Port Royal Experiment and later, during and after Reconstruction. The current complexities of land ownership and planning within the Gullah community can only be understood within this context of how the Civil War impacted land ownership patterns. In October 1861, seven months after the first shots were fired on Union troops in Charleston, the Union successfully occupied Hilton Head Island, St. Helena Island, Edisto Island, Port Royal Island and the smaller islands between, an occupation that was to last until the end of the war (Rowland, Moore, and Rogers 1996). The occupation caused an evacuation of Sea Island planters and left over 10,000 slaves behind on their plantations (Roper 1965). Not yet legally freed, the former slaves were termed “contrabands,” referring to their status as confiscated property of the plantation owners. The Union government seized control and title to the plantations, under the authority of government seizure for the non- payment of a newly imposed tax. Under the auspices of the Secretary of Treasury, Salmon P. Chase, the Union embarked on a social experiment that was to last for the remainder of the war. Titled the “Port Royal Experiment,” this action served as a prelude to and a test of policies for the later occupation of the southern states during the Reconstruction Era (Pearson 1906; Rose 1964). The Treasury Department attempted to manage the growing of cotton on the abandoned plantations by employing former slaves for wage labor. Despite a significant number of mistakes, short-sighted policy, and interference from the troops stationed in the area, the effort was nonetheless somewhat successful (Pierce 1904; Pearson 1906). From the point of view of several groups—northern abolitionists, the army, and southern politicians—the status of contraband slaves was a problematic issue. Widely varying political interests caused quick shifts in public policy and resulted in a series of broken promises to the Gullah. In the record of land divisions and sales, it is unclear exactly how and when the 10- acre grid so characteristic of St. Helena was established. St. Helena Island is the only area of the confiscated plantation lands that was resurveyed and sold in this fashion. 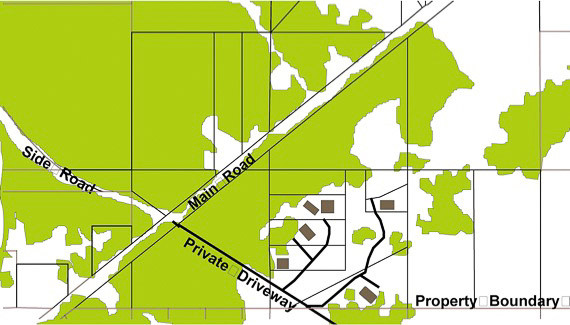 A square- grid resurvey of the land that remained in government hands after the initial sale is cited by Rose (1964), however, there is no mention of this action in other published sources. 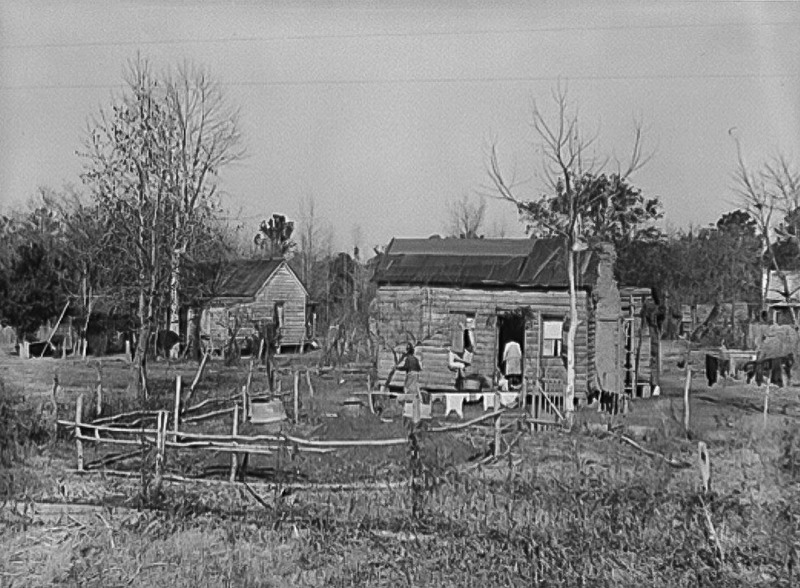 More clearly documented is another preemption system devised in late 1863, in which General Saxton encouraged freedmen to build houses on land in order to retain squatters’ rights (Rose 1964). 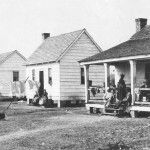 To prevent exploitation by northern speculators, the preemption program included an eligibility requirement that potential buyers must reside in the area for at least six months prior to purchase. In addition to Sherman’s order, the federal government set up the Freedman’s Bureau on March 3, 1865 (Cox 1958), with dominion over all land held by the government through abandonment or confiscation. 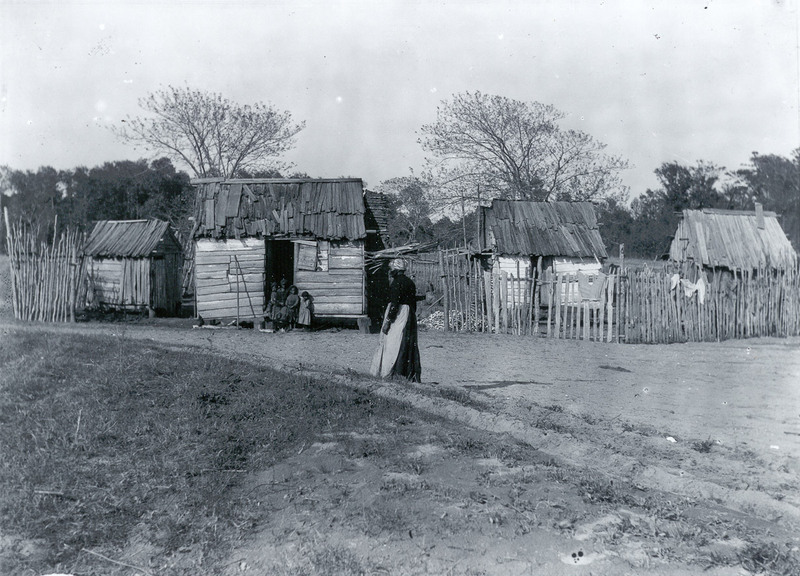 Small pieces of this land were allotted to the freedmen and later leased to them, but the question of title and ownership continued to be an issue for former slaves seeking to purchase land (Pierce 1904). Title to the lands outside of the Beaufort area was not clearly in the government’s hands, and, after Lincoln’s assassination, Sherman’s Field Order and the Freedmen’s Act were revoked by President Andrew Johnson. Many plantations that had been claimed by resident freedmen in other areas of the Sea Islands and across the South were re-confiscated by the federal government and either sold to the former plantation owners or to the highest bidders. In spite of the government’s contradictory and changing policies, by 1870 much of the islands were owned by a society of free black farmers who had an opportunity to become self sufficient. On St. Helena Island, many of the land grants made under General Sherman’s Order—as well as the previous auction sales, preemption settlement and rent-to-own programs—were never rescinded. The pattern of small holdings which remains on the land today is much more pronounced on St. Helena than on other islands such as Wadmalaw, where land rights were subject only to Sherman’s order. The seemingly random patchwork of ten- and twenty acre landlocked parcels that remains on St. Helena is thus the manifestation of an era of government experiment reconciling social policy and the determination of the Gullah to keep their land, and by extension, their family, intact. Cox, L. 1958. The promise of land for the freedmen. The Mississippi Valley Historical Review 45 (3): 413–440. Johnson, G. G. 1930. A Social History of the Sea Islands: With Special Reference to St. Helena Island, South Carolina. Chapel Hill, NC: The University of North Carolina Press. Magdol, E. 1977. A Right to the Land: Essays on the Freedmen’s Community. Westport, CT: Greenwood Press. Pearson, E. W., Ed. 1906. Letters from Port Royal: Written at the Time of the Civil War. Boston: W. B. Clarke Company. Pierce, P. S. 1904. The Freedmen’s Bureau: A Chapter in the History of Reconstruction. Iowa City, IA: State University of Iowa. Roper, L. W. 1965. Frederick Law Olmsted and the Port Royal Experiment.” The Journal of Southern History 31 (3): 272–284. Rose, W. L. 1964. Rehearsal for Reconstruction: The Port Royal Experiment. Indianapolis, New York and Kansas City: Bobbs- Merrill Company, Inc.
Rowland, Lawrence S., Alexander Moore, and George C. Rogers, Jr. 1996. The History of Beaufort County, South Carolina. Columbia, SC: University of South Carolina Press. 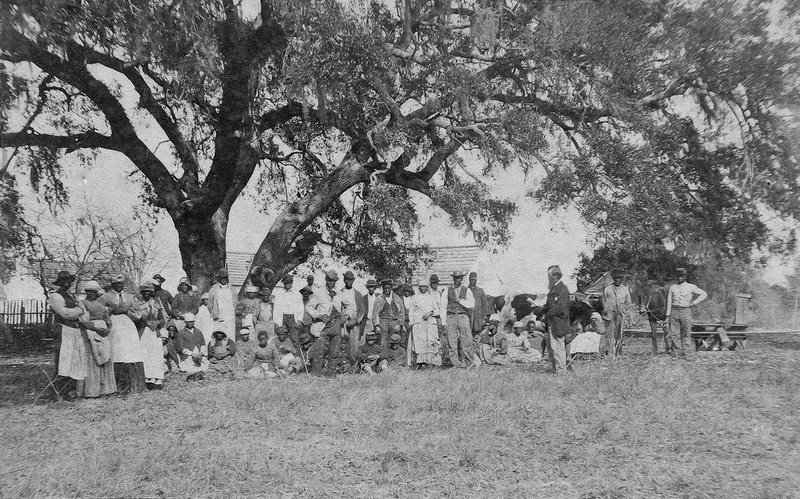 Freedmen on Marion Chaplin Plantation, Saint Helena Island. 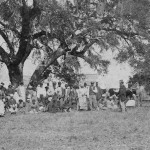 In November of 1861, when the northern army took the area encompassing Hilton Head, Beaufort and St. Helena Island, the plantation owners fled and the slaves became "freedmen." 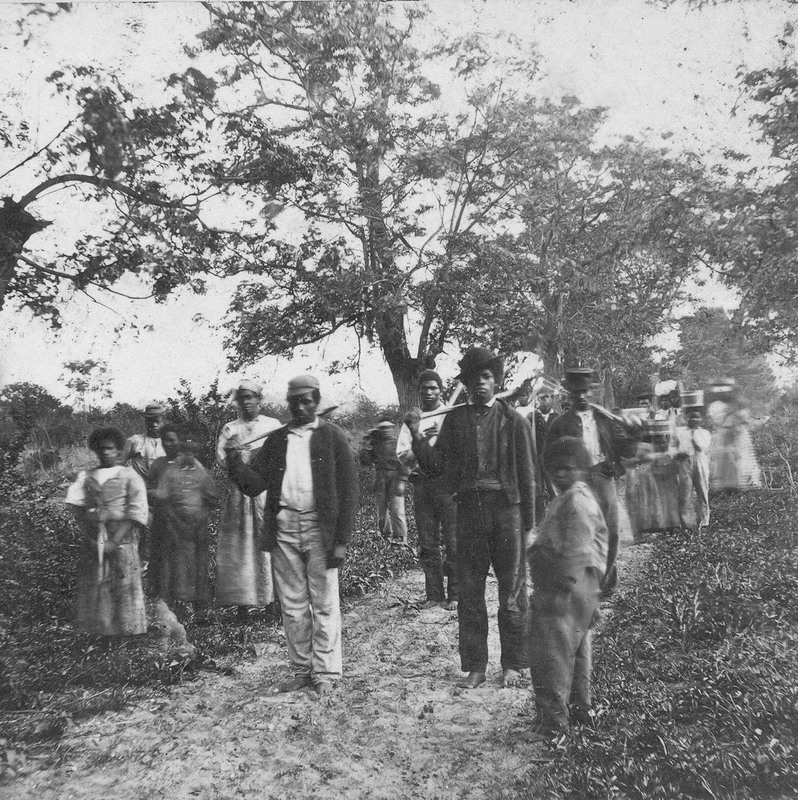 They began working the plantations for wages, and later, during 1863 to 1865, they purchased the land of their former plantations for themselves. Photo 0824a in the Penn School Papers #3615, Southern Historical Collection, Wilson Library, University of North Carolina at Chapel Hill. Reading the contract under the oak. In 1862, northerners came to St. Helena to manage the plantations and newly-freed slaves in the production of cotton. While this image is not located or precisely dated, a similar scene would have taken place as slaves became contract workers for the Northern Army. Photo 0833a in the Penn School Papers #3615, Southern Historical Collection, Wilson Library, University of North Carolina at Chapel Hill. 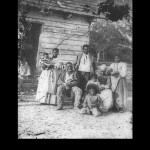 The family was a strong unit both before and after slavery. 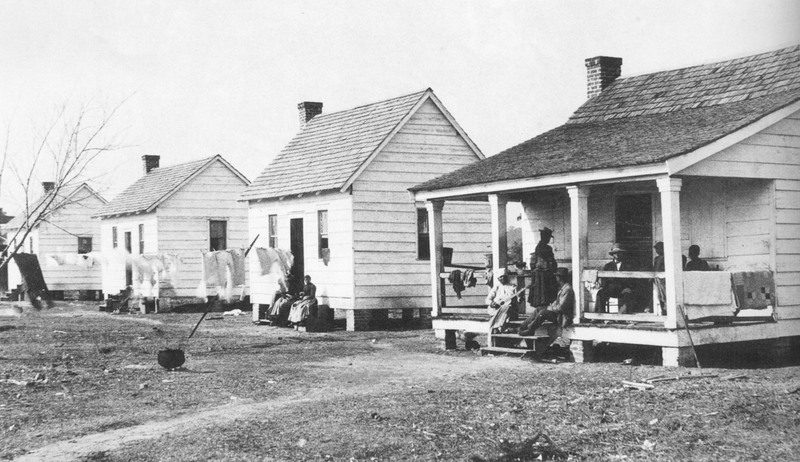 Once the former slaves became freedmen and then received emancipation, they purchased land, often in family groups. St. Helena was unique in the region, since the island was resurveyed after the northern army confiscated the plantations. 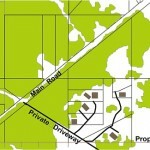 The resurveyed parcels were 10 acres in size, and can be seen on maps of the island today. These 10-acre plots were sold, and the former slaves purchased them, many in competition with northern investors. The Gullah often purchased land on their home plantations, having a strong sense of home and ownership of the land. 00057v (LC-B811-152), Civil War Photograph Collection, Library of Congress Prints and Photographs Division. 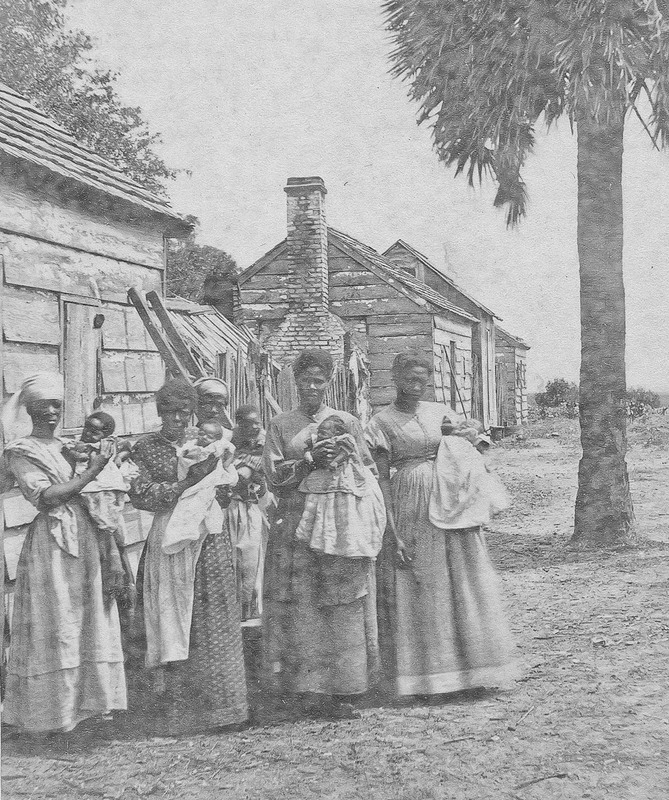 Women with babies outside former slave quarters, about 1868. 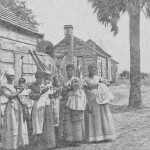 This group of women are holding small children, and standing outside of their homes, a row of former slave cabins. By 1868, many former slave families on St. Helena had been able to purchase land, often on their former home plantations. Photo 0833b, in the Penn School Papers #3615, Southern Historical Collection, Wilson Library, University of North Carolina at Chapel Hill. 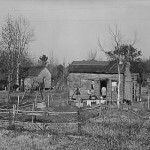 Former slave cabins became homes for tenant farmers. A former slave street in Georgetown County became home for tenant farmers after emancipation. 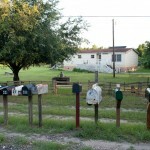 Although common in the rest of the South, this situation was unusual on St. Helena Island, where many families were able to purchase their own land and build their own homes. 06-018-M, Morgan Collection, Georgetown County Library. Bringing home firewood c. 1860's to early 1900's. 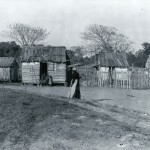 This photo shows the early development of a family compound, built on land purchased during or at the end of the War. There are two homes pictured, both with wattle and daub chimneys, and both fenced. They appear to be located at a crossroads, with evidence of wagon tracks in the foreground. There is also a pile of oyster shells in the yard of the home on the left. Photo 0945b in the Penn School Papers #3615, Southern Historical Collection, Wilson Library, University of North Carolina at Chapel Hill. 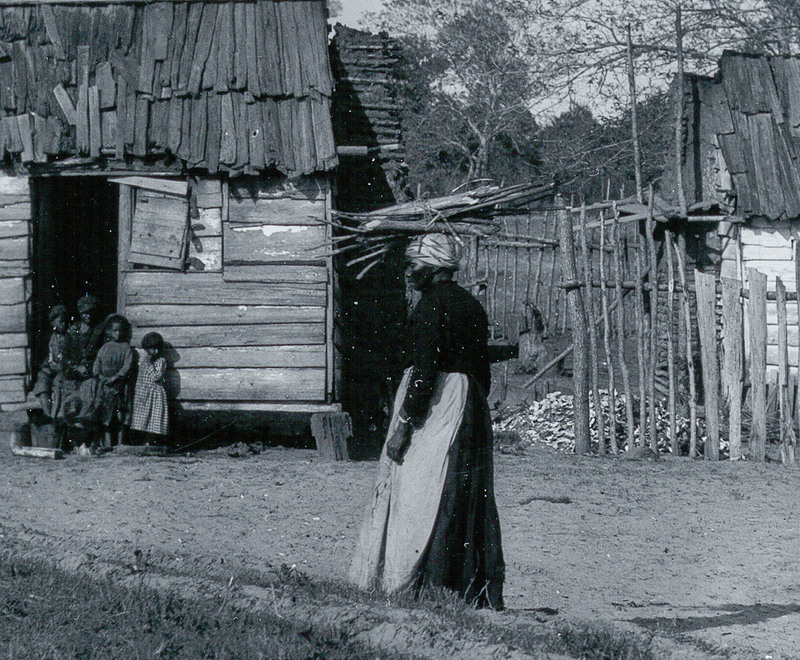 Living off the land was an important part of Gullah life, both during and after slavery time. In the close up of this photo, a pile of oyster shells is visible in the yard. Once the oysters were eaten, the shells were used for construction material in the form of tabby, and also ground up for fertilizer. As the Gullah developed their family compounds on their own land, they arranged their homes in an organic, roughly circular fashion. This was in direct opposition to the straight lines of plantation villages, and reflects the African belief that evil moves in straight lines. fsa 8c09544 (LC-USF34-050509-D), Library of Congress, Prints and Photographs Division. A typical family compound, circa 2000. Family compounds developed in a dispersed, roughly circular or organic fashion. Some front on the streets through the island, but many are set off the public roads accessed by private driveways. Family members are added, as they need homes, leading to tightly spaced clusters.